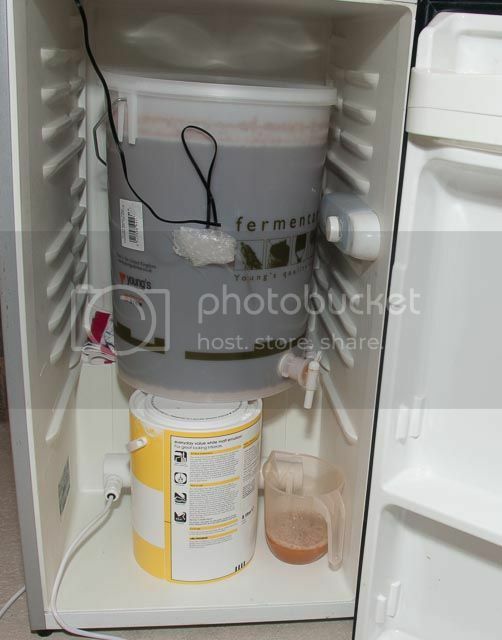 This isn't a proper how to but I thought I'd share a few photos of my brew fridge, made in early 2013 and at the time fermenting a Festival Landlord's Finest Bitter. It's not the neatest job but it was cheap and easy. Instead of expecting the glass shelf to support 25kg of beer it's resting at the back of the fridge plus a Wilkinson cheapo emulsion paint tin that I cleaned out. Taking a sample of the Landlord. I could probably have fitted the trial jar under the tap but the jug guarantees I won't spill any. Fridge - free thanks to my in-laws having a new kitchen. STC-1000 - £18 eBay. You can get them cheaper but I chose a UK seller to get it quicker and guarantee no extra VAT. 5m 16A cable - £3.50 Local electrical store. RCD - free as I already have one. The consumer unit also has RCDs but it keeps SWMBO happy. So that's about £42 plus fridge. My ferment fridges (I have 3!!) are awesome. I definitely make better beer now. You can use them for keeping bottles warm to carbonate and all sorts. I'm gutted that i dont have enough space at my place. However, if I tell my dad I can make lager i might be able to squeeze one in his garage! krazypara3165 wrote: I'm gutted that i dont have enough space at my place. However, if I tell my dad I can make lager i might be able to squeeze one in his garage! If you tell me your going to brew lager, you can squeeze one in mine (or 2 or 3 or 4). Only problem, I'm in Glasgow. Be careful plugging brewfridges into RCDs. We had a power cut once which tripped the RCD on my pre-brewfridge aquarium heaters. I came back to find a cold FV, though luckily hadn't been away too long to wreck the brew. Good guide - going to do something similar on my Brewpi build. My fermenter won't fit in a domestic fridge or freezer, so had to go down the Maxwell tube route. I use my HERMS and a "Maxi chiller" to drive it. Graham wrote: Be careful plugging brewfridges into RCDs. We had a power cut once which tripped the RCD on my pre-brewfridge aquarium heaters. I came back to find a cold FV, though luckily hadn't been away too long to wreck the brew. I don't plug the fridge into the plug-top RCD any more for exactly that reason. The whole house is protected by RCDs in the consumer unit so it's overkill anyway. I use the auxiliary sensors on my weather station to monitor all my ferment temps, it's saved the day on several occasions. I've got a fridge with a top compartment as a freezer which I want to convert to a FV fridge. I understand the wiring for the Stc 1000 but I'd like to know where does it get the heat from ,what do you wire it into? Is that it behind the paint tin? 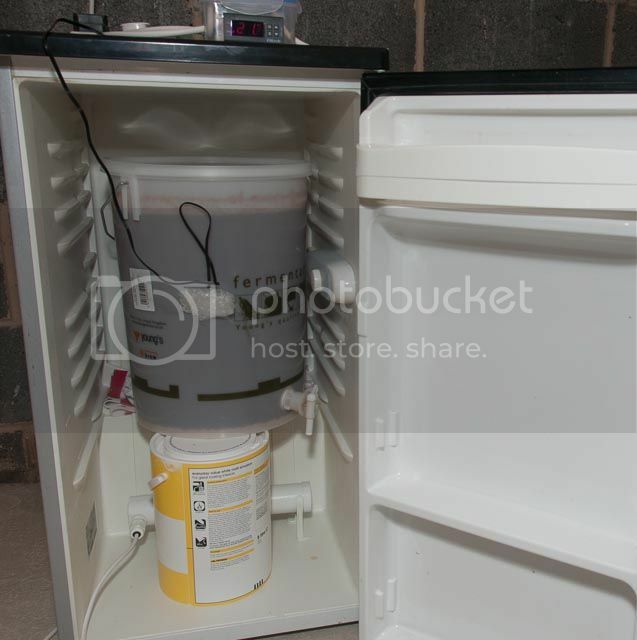 Is the cold feed straight into the fridge/thermostat? HoppyG wrote: Is that it behind the paint tin? Yes and yes. No mods to fridge. No it wont, you need a "radiator" to warm your fridge! The heatpad will warm the fridge. If you attach the probe to the FV then you are measuring the wort temperature. At about the same rate you can fill a DJ with a teaspoon! Here's an old pic of my 30-year-old bar fridge I converted into a 2nd fermenting fridge about 6 years ago & also used for getting starters going at the correct temp (great for Belgians ) as well as lagering kegs if need be. Freezer has been folded back, door shelving discarded & the original thermostat has been shifted to the rear. 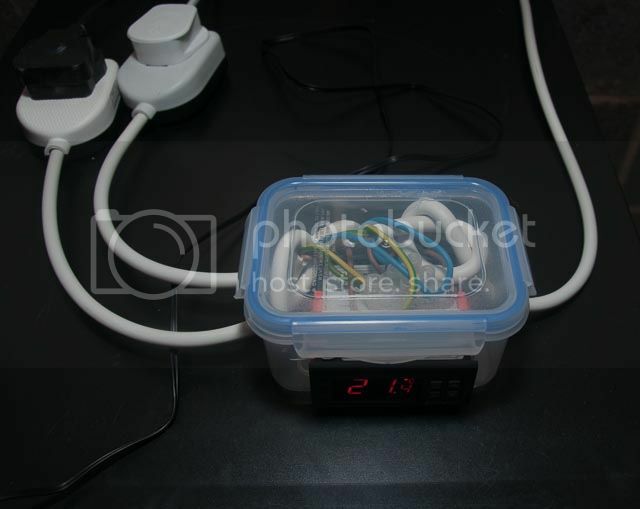 Cooling/heating is controlled by a TempMate controller on top of the fridge & those red thingos underneath the shelf protect the (electricity) connections from the damp. One for the heating pad & one for the stir plate. Ply shelf has since been replaced with aluminium checker-plate & am in the process of converting a corny keg dip tube into 2 x thermowells so that the controller probes in both fermentation fridges can be placed in the centre of the wort to give a more accurate reading. With apologies to A. B. (Banjo) Paterson. I went to a mental hospital and asked the doctor how they decide who they keep in. He took me to the bathroom and filled the bath, he then gave me a bucket, a mug and a spoon. He told me that they give the person the 3 items and ask them to empty the bath the fastest. I said "I see, the one that uses the bucket gets to go home", he said "no the one that pulls the plug out goes home, I've got your room ready".